Fortunately, the genre is deep. Beneath the shonen surface, there are interesting volumes that make it over here. The strange. The beautiful. Classic stuff. Food stuff. Funny stuff. Good for: learning about food and care. Good For: gripping, sad human drama. A historical drama about a family falling apart post-WW II, with interlocking story lines and a dark narrative. Everyone is pretty terrible, which makes for good reading. It’s from Osamu Tezuka, the unbelievably prolific “godfather” of manga. This is a great example of his serious side. Good For: early 20’s soul searching dramedy. “Straddling the line between her years as a student and the rest of her life, Meiko struggles with the feeling that she’s just not cut out to be a part of the real world.” Asano’s art is unbelievable, totally unique and unconventional. And it’s a funny book. The early-20’s feelings it brought back were so familiar it was almost uncomfortable. Good For: entrepreneurs. I swear. This is a book literally about the invention and creation of the Nissin Cup Noodle. Like a Wikipedia article come to life! This hard-to-find Project X series might be my favorite manga yet, and I’m probably the only buyer. It’s something only the Japanese would do: business manga! I wish there were a hundred volumes for every product. Good For: getting excited about business. Once again, this is literally what it says it is: a manga about how Seven Eleven came to Japan, the challenges they faced, and how they pulled it off. Did you know the Japanese actually invented the walk-in cooler concept that revolutionized the convenience store industry? Have I mentioned how much I love the concept of Business Manga? Good For: because business is awesome. And cars. This is the dramatic story of the creation of the most successful sports car in the world, told through manga. The last business one, I promise. “This manga demonstrates the virtues necessary for businesspeople to succeed”, says the top Amazon comment. Yes, it’s good. Good For: laughing at a cat running a ramen shop. A former kitten model (!) who ran away from home finds a new life as the owner of a ramen shop. (He doesn’t really seem to understand he’s a cat.) His best friend is a loyal customer who suffers through the many troubles related to, well, a cat owning a ramen shop. It’s not deep, but it’s funny. You’ll breeze through this on the toilet and laugh so much you’ll be glad you’re on said toilet. Good For: clififhanging early manga pulp adventure. A movie-like, page-turning adventure about a pianist, a criminal, an avalanche, a train, an abandoned ranger station… you’ll see. This manga was written over 50 years ago — it’s one of the first ever published works of gekiga (adult, serious, dramatic) manga. It’s short. It’s simple. But I loved it. If you’re not familiar with manga “classics”, why not start here. Good For: autobiographical manga history. Tatsumi, the author of Black Blizzard (above), as the father of “gekiga”, tells his own story. This 840-page epic covers the early days of the manga publishing industry, post-war Japanese history, his personal life and influences, and more. It’s really good. And his art style is fascinating: comically simple faces, hugely intricate and complex backgrounds. Conversely, here’s the story of Azuma, a fringe Japanese comic artist who, through alcoholism and presumably mental illness, essentially becomes a homeless drifter. This stuff really happened. Written in a weirdly light and comic style — I don’t think he wanted to dwell on the darkness — it’s amazing to read this and see how easily life can go off the rails. Good For: phantasmagorical blues music drama. A stunning, fictional, supernatural folktale about the non-fictional Robert Johnson, blues musician, who sells his soul the devil in exchange for musical talent. And lots more. The art is utterly fantastic, the story is gripping and crazy, and the setting of the American South in 1930s is really interesting / challenging for a Japanese manga. Somehow it all works. Good For: soap-opera medical cautionary tales. Good For: insight into raising an autistic child. “A long, realistically drawn narrative about a young couple coping with the discovery that their infant son is autistic.” The josei manga (“ladies’ comic”) genre can get a bit syrupy, but I include this in my list mostly as a great example of how manga can touch on topics that traditional graphic novels don’t typically touch. I think it’s educational and fascinating. Good For: dramatic, riveting Tezuka storytelling. “As events progress, the lives of three Adolfs, each from distinct origins, intertwine and become more and more tangled as Sohei Toge searches for his brother’s murderer.” Another intense and solid Tezuka drama that I just finished. I can’t wait to pick up the second volume next year. I hope you enjoy some of these. If you do — or don’t — let me know! Ten lucky people who post a comment recommending their own favorite graphic novels (of any genre) will get a free copy of Project X: 7-11 or Project X: 240ZX. Seriously, I’ll just mail you one. I don’t know why. Business manga! Good luck! This entry was posted in Reading by cabel. Bookmark the permalink. I really enjoyed the Ghost in the Shell manga. It’s so much more crazy and complicated than the anime version – it really pushes the medium in some brain-twisting ways. Alan Moore’s graphic novels are pretty amazing, but they’re a standard. Recently, I really enjoyed Chip Kidd’s take on Batman with “Death by Design.” The art is great. The story is OK, but it features great nods to design and architecture. I’m getting back into comics with my 4-year old daughter. We enjoy all the Ghibli photo books, they’re universally awesome. The recent Adventure Time collection is also a big hit, and we’ve been getting the monthlies of all the other Adventure Time books. Nice roundup. I will definitely check some of these out! My favorite graphic novel of all time is “Like A Velvet Glove Cast In Iron” by Daniel Clowes. It’s a bizarre, Kafkaesque and Lynch-like adventure story. Clowes’ art is amazing as well. While it’s one of Clowes’ first works, I think it’s so much better than his popular novel “Ghost World”. A manga series I can’t recommend more strongly is “Pluto” by Naoki Urasawa. It’s an epic sci-fi detective story based on on Osamu Tezuka’s “Astro Boy” universe. I don’t read so much Manga but I love graphic novels; Building Stories is great, of course, as is all of Ware’s stuff, Asterios Polyp is wonderful, Daytripper is amazing… As far as monthly comics go, I’m a big fan of Mark Waid’s stuff; his Daredevil run is great, as is his just-starting-up Indestructible Hulk. I really liked Tonoharu by Lars Martinson. It’s an autobiographical account of an American living in Japan and teaching English in public schools via the JET program. Perhaps I am predisposed to liking it since I am a JET alumni, but I believe if that were not the case i would still enjoy it. Lars’ work is excellent, both from an art and storytelling perspective. I just learned about Moyasimon: Tales of Agriculture, which is about a guy going to agriculture school who can see bacteria macroscopically (they are adorable). Lots of Japanese food lessons in there, Good for learning about fermented stuff, with names of microbes and everything! See more here in Scientific American. I loved Beck. A manga about a wannabe rock star trying to have a band and reach the top. Hikaru-no-go is great too, but might be a bit too Shonen for your taste. Nodame Cantabile, about classical music. Sakamichi no Apollon (Japanese) about jazz. Kami no Shizuku (Japanese) about wine. Planetes, about love and friendship among space-debris collectors. Glass Mask (Japanese), about acting. Paradise Kiss, about modeling and fashion. 20th Century Boys, about a group of kids’ childhood fantasies gone horribly wrong. Phew, I should stop before this list gets too overwhelming!! Le Sommet des dieux by Jirō Taniguchi, a powerful and gripping story about mountain climbing and the Himalayas… Sadly, only available in Japanese and French, it seems. 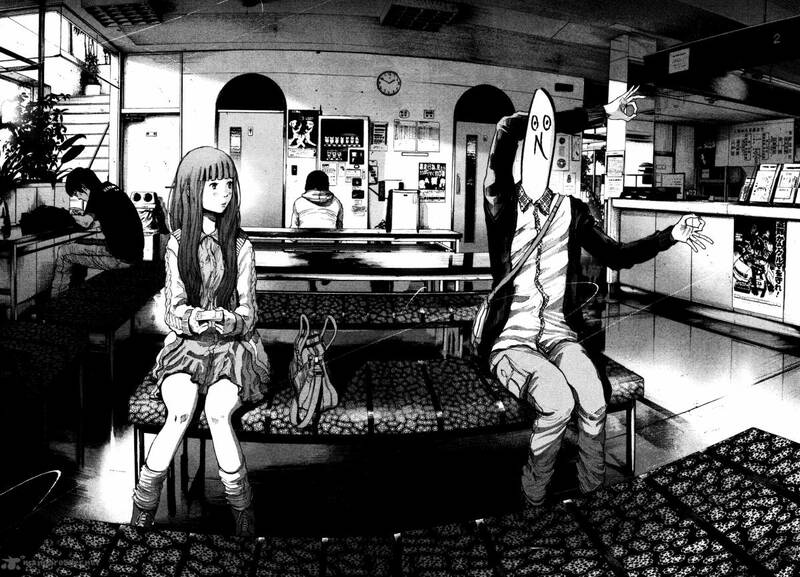 I really enjoyed Oyasumi Punpun. If you enjoy beautifully drawn black and white graphic novels i’m sure you’ll like it. I recommend anything by Kaoru Mori (Emma is her first series, Bride’s Story is her current) and Yotsuba&! by Azuma Kiyohiko. The art is amazing but the stories are just wonderful takes on what we consider every day life. Azumanga Daioh and Yotsuba are pretty charming. Azumanga Daioh is about a bunch of girls going through high school, comedically. I think the only male character is a teacher. There’s a lot of episodic little gags, but it’s very, hm, sincere? Also there is an anime series of this, and it’s good too. Yotsuba is about a little kid (maybe five?) who’s been adopted by a single guy for some reason. Its entire purpose seems to be to point out how awesome life is. It’s pretty dang cute, but not in a saccharine way. Cromartie High is a satiricalish take on high school toughs mangas. It’s really just weird, and highly amusing. There is both an anime and a live-action movie now! Steve got a couple of the Oishinbos, and they rule. I want more. Absolutely love the Oishinbo series. In the photos of the covers you have you’re missing the Vegetable one. As for recommendations Genshiken is slice of of Japanese geek culture series. You may enjoy it, it’s goofy but it is based in real Japan and references real games and manga. In the manga style but done by westerners King of RPGs by Thompson and Hao, and the first volume of Wonton Soup by Stokoe are quite enjoyable. Zen of Steve Jobs should be mentioned, but it’s not manga. I recently visited France, and was shocked by the massive Graphic Novel culture they have. You walk into bookstores (yes bookstores exist and thrive there) and typically the first main level is Graphic Novels, Manga and SciFi. The Bon Marche is a high end department store, half the top floor is books and graphic novels. One particular street has 11 comic book stores. I was floored. Incredibly varied selection of books as well. I wish those would start getting translated. I bought a few just for the art. Nausicaa of the Valley of Wind is an amazing 4-volume manga by Miyazaki Hayao (Spirited Away, My Neighbor Totoro), the first 1.2 of which got turned into the movie of the same name. Post-apocalyptic feudal scifi, but with all heart and no technobabble. I see you’re into Tezuka. I don’t know if it has an English translation, but his “Phoenix” is one of the most ambitious and profound things I’ve ever read. I also recommend “Buddha” and “MW”. You would probably love Jiro Taniguchi too. Earlier I backed a Kickstarter to translate Osamu Tezuka’s Barbara. A dark, comedic story about a tortured artist and his drunk, homeless muse. It arrived a couple of months ago, and it’s great. It might be a bit redundant or passé for me to recommend one of the most popular manga of all time, but… I believe that Eichiro Oda’s One Piece is the pinnacle of human achievement, on par with any great masterwork of any century. Oda’s somewhat goofy, Disney- and Toriyama- style art and characters belie the depth of the story arcs. Start at the beginning, and read through the Arlong Park, Alabasta, and Water 7 arcs. These rival absolutely anything Hollywood has put out in years. There might be a little of the infinite-battle, consant powerup, shonen-ness to it, but the characters are so disparate and solid, and the umbrella-story is so interesting, that you never feel like things aren’t moving along. It doesn’t ever get old. Which is good, because the first “Half” of the series is about 600 chapters long. I’ve gone back to re-read portions of One Piece, and am generally pretty amazed at how far back I can go and find things that I’d missed the first time. Hints and foreshadowing of future events, and so forth. This is the most imaginative fiction I’ve ever read (along with Rothfuss’ Kingkiller Chronicle), where the characters, settings, and events seem utterly real and plausible no matter how fantastic the author pushes things. There are problems with some of the localizations, unfortunately. Sanji swears and smokes cigarettes, not lollipops (groan). Zoro’s name is not “Zolo”. Otherwise there should be nothing to stop anyone from getting into the One Piece manga, aside from the daunting length (and that it’s still running). I’ve been a fan of Megatokyo since I was a teenager. It started as a Penny Arcade-style game-and-anime-joke webcomic, but has since deepened to seriously explore the absurdity of fan behavior, the unrealisticness of popular genres, and the idea of subjective reality—without ever dropping the Rent-A-Zilla rampages or sly anime references. Megatokyo is available free online, but they also publish reorganized, high-resolution print editions (and since the artwork is detailed, uninked pencil, it definitely benefits from it). I personally think that the best way to start it is to read Chapter 0 online, which gets you through the part where they had no idea what they were doing, and if you like the direction it’s going at that point, start reading the print editions. A new omnibus of the first three volumes is coming out next month. – parasyte: a manga about parasitic little aliens that kill and take control of human “hosts”. They have the power to mutate/extend the parasite part of themselves. They live in secret among humans. One parasite fails to take over a teenage boy and instead can only control his forearm and hand. To survive they must work together of course. I love this one. It’s so good. At first it’s a basic one guy vs secret aliens story but it becomes much darker and more philosophical about life, earth, the environment, and humanities right to exist. – Tintin: stories about a young adventurer and his dog Snowy. Set in the early 20th century. – Asterix & Obelix: hilarious comic about a tribe of Gauls with a potion for super human strength. Set in France during the Roman era. It’s strange to me that it remains relatively obscure after a major motion picture, but Scott Pilgrim is definitely one of my favorite graphic novels. It’s a little hard to describe, but calling it a surrealist teenage dramedy would be close. These are some pretty interesting suggestions. Some friends have recommended manga to me before but I can’t ever seem to find something I liked. Maybe I just wasn’t digging deep enough into it. Try “The Two Faces of Tomorrow” as a Fun sci-fi read on rogue computer AI. I second ‘Nausicaa of the Valley of the Wind’ – just finishing my second read through. Amazing. You might look for the larger 7 volume version as well. My all time favorite? Yotsuba&! And the one I’m currently reading: Death Note. At its heart, it’s about the cat-and-mouse game between a serial killer and a genius detective. Most of the Alan Moore stuff (Watchmen, V for Vendetta) are classics. More recently, Brian K Vaughan’s “Y: The Last Man” is an enthralling saga featuring everything you need from humour, romance to action and heartbreak. I also love all the Tintin graphic novels. I am a fan of the ‘future dystopia’ that Shirow Masamune has created in his head. My favorite of his works include the Ghost in the Shell series (1.0, 1.5, and 2.0) as well as Dominion Tank Police. Both are oldies but goodies. Great list and even more in the comments! I’m currently reading Berserk, which I very much enjoy. The recent anime movies have been a pretty good reproduction of the manga series. Another good one, about rock climbing of all things, that I’ve recently picked up is Kokou no Hito. I’ll second “Pluto” by Naoki Urasawa, but I’m a huge fan of Yakitate Japan. Much like Oishinbo, it’s chock full of great learning on food and ingredients, but set in the style of a comedy shounen fighting story, where contestants compete in bread baking tournaments. I can’t believe you forgot Initial D! Oh, and From Hell by Alan Moore. Commenting on my own post. Is that weird? I also want to check out Thermae Romae. I Kill Giants (http://en.wikipedia.org/wiki/I_Kill_Giants) is a really powerful American comic book/graphic novel about a somewhat nerdy girl who uses fantasies about giants as a form of escapism. i have to recommend anything by Felipe Smith: MBQ, Peepo Choo and (if you can find it) Money. Adrian Tomine does the covers for the New Yorker and made one of my favorites called Shortcomings about a modern relationship. It some beautiful shots of the West Coast and New York City and is very voyeuristic. Looks like two people have already recommended my first choice, Nausicaä of the Valley of the Wind by the amazingly talented director Miyazaki. But I will point out that there is a recently published box set that looks gorgeous and makes me wish I didn’t already own it. As an alternate, I will recommend one of Neil Gaiman’s earliest (and maybe least well-known) graphic novels, Violent Cases. – Kozure Okami (Lone Wolf & Cub). Each tome is made of 4 o 5 little stories of the ancient Japan. – Vagabond. The best manga I’ve been reading so far. The first graphic novel I ever bought was “Blankets”. It was a total impulse buy, I knew nothing, and I picked it up simply because I liked the the cool blue cover art. It turned out to be an extremely heartfelt autobiographical book on the author’s early youth and first love. It was beautiful without being saccharine and affected me so deeply that, since then, I started trying to find and build up a collection of similarly unique comics and manga. This list and the comments has been super inspiring, so I hope someone out there gets the chance to enjoy Blankets as much as I did. My favourite graphic novel are both written by Craig Thompson – Blankets and Habib. Amazing. Fun Home by Alison Bechdel is also great. Hmm rare to come across a list that is so far from mainstream manga. Two of the more obscure mangas I’ve read: “I.S. Otoko demo onna demo nai sei”, a collection of dramas revolving around intersexuality, and “Haibane Renmei”, a fantasy doujinshi which has an universe that is much more elaborate and fascinating than what you’d expect from a doujinshi. Scott Pilgrim: manga-esque coming of age dramady, really funny and sincere. Anything by Shintaro Kago, if you can stomach body horror and extreme psychological horror. And Velveteen and Mandela: a post apocalyptic manga that has the feel of a zombie movie written by David Lynch and directed by John Waters, really twisted and dark. Oh yeah, I forgot 16 miles from Merricks! A guy discovers a mysterious beautiful woman in his apartment that lead him through a underground labyrinth. Beautifully drawn, great story. Includes also some more strange short stories. I have to put Joe Sacco’s “Safe Area Goražde”, a sobering mix of war journalism and graphic novel, as one of my recent favorites. The autobiographical “A Drifting Life” by Yoshihiro Tatsumi is a phenomenal read.